Easter stamps are popular stamps to collect, but they are not issued as widely as Christmas stamps. This is most likely because people do not send as many Easter cards as they do Christmas cards. Still, there are some good-looking Easter stamps issued each year. My favorite set of Easter stamps is a set of three stamps from the Cook Islands in a souvenir sheet issued in 1972. The stamps are based on the illuminated manuscript of a page from the prayer book of Robert de Lisle circa 1300 and depict the crucifixion of Christ withtwo of his followers. The left stamp is adisciple with a value of 5 cents. The right side stamp depicts another disciple and is worth 30 cents. The middle stamp is Christ on the cross and strangely only has a face value of 10 cents. 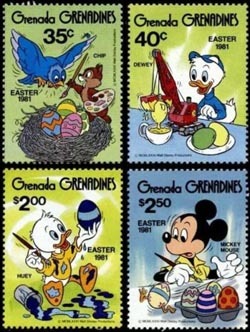 My next favorite Easter stamps are of a different tradition of Easter - Easter eggs.They are combined with another family favorite - Disney characters. This is a set of 4 stamps issued by Grenada in 1981 to celebrate Easter. The $2.50 stamp shows Mickey painting his eggs with one running away as it starts tohatch. The $2.00 shows Huey painting an egg, but he is wearing most of the paint. Next up is a 40-centstamp showing Dewey dipping his eggs into a bowl of paint using a model crane. Finally there is Chip on a 35-cent stamp painting eggs in a nest and the mother bird looking shocked and surprised at what he has done. 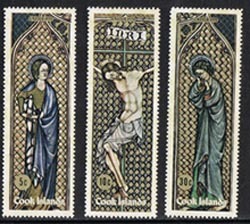 The last of the Easter Stamps I like are the stamps issued by Croatian Post in 2011 called the Stations of The Cross. 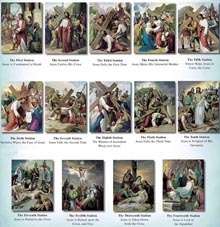 It consists of14 stamps, one for each of the Stations of the Cross. Each stamp is 3.10 HKR.Orsat Frankovic and Ivana Vucic design the stamps; the motif is designed by Zlatan Vrkljan.